This article first appeared in the book titled "Heritage Management in Australia and New Zealand: The Human Dimension", 2nd edition, edited by C. Michael Hall and Simon McArthur, Oxford University Press, 1996. History is storytelling, in that stories are inherently teleological. A historical narrative tries to find meaning in a sometimes chaotic chronological reality. As a result, the scholar makes value judgments in the story to give it unity The aim is clarification of a past that would otherwise lack order and meaning (Cronan 1992). Historians have traditionally found their sources in archival records. Over the past thirty years, however, social history's methods have significantly widened the scope of historical narrative. In aiming at a wider audience, social history has utilised non-traditional sources like oral history, aerial and historic photographs, archaeology, material culture, census data and weather records. These sources have helped to build a forum for the 'inarticulate', a term for subjects who have traditionally been left outside the realm of commemorative work. Widening the scope of historical narrative has frequently resulted in more complex interpretation of the past and should point the way toward greater understanding of the past in heritage management (Rickard & Spearritt 1991). Parks continue to be a major focus of heritage management but have been a relatively quiet backwater in traditional historical narrative. The relatively new field of environmental history, however, can place them within the larger context of interaction between nature and culture (see Griffiths 1991). Since nature cannot speak, environmental historians have tackled a wide range of subjects, eager to embrace social history's techniques of assembling source material. Environmental history is a field concerned with the role and place of nature in human life. The first part of this chapter identifies sources potentially useful in reconstructing historic environments. It is followed by an overview of methodological problems related to the question of change in nature. Cultural landscape reports and administrative history are then outlined, because they have specific application to park settings and can draw from the sources identified for environmental history. Since historians have generally limited their study of the past to the period associated with a written record, prehistory has been left to other disciplines like archeology, geology, paleontology and physical geography. Where historians involved themselves with prehistory it was usually to trace the development of scientific theory through traditional sources. Travel accounts written during the period of initial European settlement have been utilised by scholars interested in historic environments. They hope to establish a presettlement landscape as a baseline from which to assess subsequent changes. One difficulty with using travel accounts, however, is that they are written in places where the journalist is not actually travelling; instead the diarist is summarising past events at a convenient place. Another problem is how to tie the usually limited detail (little of which could be utilised quantitatively) to specific localities. The paucity of locality information often occurs in even the best accounts, such as those left by collectors of natural history specimens. The only site-specific records available in many areas about presettlement landscapes are land survey notes. These have been helpful in establishing a historic condition of some forests, riparian habitats and grasslands. Their reliability varies, however, because there can be limitations such as insufficient description, bias in recording data, contract fraud and land use prior to survey (Galatowitsch 1990). Another way to document landscape change is repeat photography. Where available, photographs of conspicuous natural features through time represent ways to develop a theme in an accompanying narrative (Rogers et al. 1984). An investigator can locate previous photo points and replicate them, sometimes in a series. Cross-dating techniques are useful in assessing historic disturbances by fire or other agents. Fire histories are usually based on comparisons of fire scars with tree ages obtained from increment cores or wedges. Similarly soils can be used to date historic disturbances from logging, grazing or human occupation. Through soils referencing, the disturbed site is compared with the profile of adjacent control areas. This method may help date removals of forest cover, the introduction of exotic flora or occupation sequences at a historic site. Despite the array of potential sources and techniques, scholars still debate the validity of environmental history's method. Cronan (1990) asserted that good work in environmental history incorporates three levels of analysis. These are the dynamics of natural ecosystems in time (ecology), the political economies that people erect within these systems (economy), and the cognitive lenses through which people perceive those systems (the history of ideas). One major problem is that ecology is a very fractured discipline, where there is no consensus on a definition of nature. The ecosystem model, with its emphasis on biodiversity and complexity, is not universally accepted because some ecologists argue there are no systems in nature. Ecology has turned out to be a swamp for environmental historians rather than a firm foundation. Its fractured condition has led critics to ask if past conditions are so difficult to quantify or assess, how can historians identify change in nature? This is a crucial question, because environmental historians generally depend upon change producing social and economic effects to proceed with a discourse on cultural perceptions. Cultural landscape documentation is somewhat narrower in scope than environmental history because the question of nature's character is not so central. Nevertheless, it emphasises change over time and represents a way to integrate nature with culture. Adaptable to a park setting, its emphasis is design, material, change, function and use. One of its main effects on heritage management has been to broaden the focus of historic preservation beyond buildings to the associated landscape. Broadly defined, a cultural landscape is any geographical area that has been affected by human activity. Since the term can be applied to heritage areas, managers and staff should note values associated with cultural landscapes in their planning and maintenance activities (Birnbaum & Wagner 1994). Generally regarded as a landscape having historic value, it is classified as at least one of four types. Historic sites are associated with what has traditionally been understood as important events, activities or people. Existing features and conditions are interpreted primarily in terms of what happened there at significant times in the past. Managers of these areas would most likely aim to preserve a specific appearance because uncontrolled change might damage the landscape's commemorative value or integrity, the latter being an ability to communicate significance. Historic designed landscapes are deliberate artistic creations traceable to recognised styles. They are valued because of their aesthetic qualities and are associated with significant people, trends or events in landscape architecture. Management involves identifying the types and degrees of change that can occur without harming character-defining features. Examples of these types of landscapes range from formal gardens to naturalistic design (where the features are sublimated to the surroundings) in larger park areas. Historic vernacular landscapes illustrate values and attitudes toward the land and reflect settlement patterns. Associated with a nation's demographic, social and economic development, vernacular landscapes have more often been associated with rural areas. Physical change may be essential to the continuation of uses that made the landscape significant enough to implement some form of landscape management. Ethnographic landscapes are used by aboriginal and/or ethnic groups for traditional activities that range from subsistence hunting and gathering to religious ceremonies. These are landscapes seen through the eyes of one or several cultures. An understanding of an ethnic culture's folklore, as well as thorough linguistic and ethnographic research, are essential for an appropriate management response, especially in sensitive areas. A cultural landscape report (CLR) is an approach developed in the late 1980s for the documentation and evaluation of a landscape's character-defining features, materials and qualities. Usually interdisciplinary in scope and character, it incorporates documentary materials familiar to the historian, an interpretation of the archeological record for the site and a thorough physical investigation of the extant landscape. The intent is to minimise the loss of character-defining features and materials, so its key components are a physical history and site analysis upon which treatment and development alternatives are based. A CLR narrative should provide historical context, key developments, design intent, primary design principles, patterns, features and significant events or individuals associated with the landscape. Research into the archival record (such as manuscripts, diaries, correspondence and newspaper articles) has been the traditional basis for this type of writing and generally should precede fieldwork. Documentation of the historic periods, however, would not be complete if oral history, maps and photography (aerial, infrared and historic) are ignored (Gilbert 1991). The primary purposes of fieldwork are to identify resources, define their exact locations, determine their integrity and condition and evaluate their significance. In documenting cultural landscapes, this may entail sampling, excavation, examination of architectural fabric or ethnographic study. An inventory of character-defining features, along with documentation of existing conditions and related site information at the appropriate scales, follow the narrative history As an example, a site-specific typology might be developed for designed landscapes located in a park setting. On a site characterised by naturalistic plantings and rustic structures, the typology could encompass circulation (roads, parking, walkways, trails), vegetation (planting concepts and materials), structures (buildings and rock walls), small-scale features (signs, fountains, curbing, benches) and include stonework, planting and paving as construction technologies (Gilbert & Luxenberg 1990). Recommendations in the cultural landscape report should be aimed at how to best perpetuate the integrity of character-defining features. If organised by topical areas, the recommendations can include a set of historic design principles based on precedents cited in the narrative history. These principles can be generalised, but will furnish direction for any new development in park settings; the aim is to ensure continuity between new and historic design, both in function and material. Planners, managers and staff should benefit from a park history, especially if the account successfully synthesises the available source material into coherent themes behind ongoing and recurring issues. In addition to serving purely scholarly purposes, park histories may provide a basis for developing interpretive and visitor management programs. One way to do this is by highlighting competing cultural, religious or economic values in the narrative (Linenthal 1994). To meld expressions of these values into coherent themes at a site, it may be necessary to go beyond the extant documentary record and find other sources. Oral history can play an important role in illuminating points of view not readily apparent in administratively generated records and may lead the researcher to additional documentary material. Agency-sponsored oral histories have also been used as a public relations tool by park authorities, especially where the interviews are conducted with local residents as part of an ongoing program. Reliability is a great concern in oral history however, and can depend on the relationship between the interviewer and the narrator (Lang & Mercier 1991). Even so, oral history has the potential of contributing to a multicentric approach to history where different interpretations of the site or associated events demonstrate to heritage managers how history is constructed. A park administrative history has been described as an explanation of the unit's conception and establishment, as well as its management to the present (Mackintosh 1991). As a guide to more informed decision-making, its main audience consists of park staff. The more valuable administrative histories resist the temptation to indulge in an exhaustive account of a park area's early history relating only what new managers need to know as they assume their duties. An administrative history usually includes five types of information. The first is a brief descriptive statement about the park, for initial context. It should incorporate the park's location, purpose, significance and primary resources. Following the introductory statement is an account of area use and management prior to its acquisition by the present park authority. Important aspects should be further developed where they have bearing on current administration. A national park or reserve, for instance, might once have been managed by a local association, administered under another government department or purchased from private holdings. An account of the movement to establish a park is a vital part of an administrative history because it can provide critical insight about legislative intent. Emphasis in this section should he the motivations of key organisations and people promoting (as well as opposing) the park's establishment. Special care should be taken to note the positions taken by legislators and government agencies (including the park authority) on the proposal. Once the conditions behind the park's establishment have been delineated, the bulk of an administrative history should be a synthesis of the major events and activities subsequently affecting the area's management. Broad topics such as land acquisition, facility development, planning and resource management should be addressed separately as chapters or sections. The work's scope should be comprehensive, but there is no need to think of it as 'finished' once a volume is printed. Chapters can be added periodically to keep the administrative history updated, or when topics not covered in previous work need to be addressed (Mark 1991). Appendices containing copies of important legislation, agreements and studies will increase an administrative history's value as a management reference. An index is important where readers might have to do some cross-referencing, as in a chapter on scientific research. Many commonly used wordprocessing programs make the task of indexing relatively simple. Administrative histories can draw from a variety of sources, but the most basic are legislative documents (available in libraries) and the park authority's files. The latter may be in the park, central office or state or national archives. Collection of the government records or papers pertaining to important individuals or organisations can be a long and sometimes expensive process. Once assembled, however, the material can be an enormous asset to park management by forming the basis of a working archives or database. A good history is a structured narrative supported by verifiable sources told in a manner which communicates the significance of past events. To professionals receptive to historical narrative, it is an analytical system for understanding time and space. That system is dependent upon chronology for its organisation, something which has had limited appeal among the general public. If historians want to impart concepts and analysis to the public, they must understand that citizens' interest in the past is largely that of social utility A real or imagined association, whether through family genealogy or the conversion of historic structures to new uses, is how most people locate themselves or their community in time and space. This reference point to history can be separate from that of professionals' (Leffler & Brent 1990: 89). For a bridge to be built from environmental and park history to public interpretation requires that people become an organising device in historical narrative. There can be more than an abstract character, as public uses of oral history or so-called 'living history' have at times demonstrated. If the message is clear and tailored to its audience, it should become easier to mass support for heritage programs. Birnbaum, C. & Wagner, C. 1994, Making Educated Decisions: A Landscape Preservation Bibliography, US Department of the Interior, National Park Service, Washington, DC. Cronan, W 1990, 'Modes of prophecy and production: placing nature in history', Journal of American History Vol. 76, No.4, pp. 1122-31. Cronan, W. 1992, A place for stories: nature, history and narrative', Journal of American History, Vol. 78, No. 4, pp. 1347-76. Galatowitsch, S.M. 1990, 'Using the original land survey notes to reconstruct pre-settlement landscapes of the American West', Great Basin Naturalist, Vol. 50, No. 2, pp. 181-91. Gilbert, C. 1991, 'Tools of the trade: methodologies in landscape preservation', The George Wright Forum, Vol. 8, No. 2, pp. 2-12. 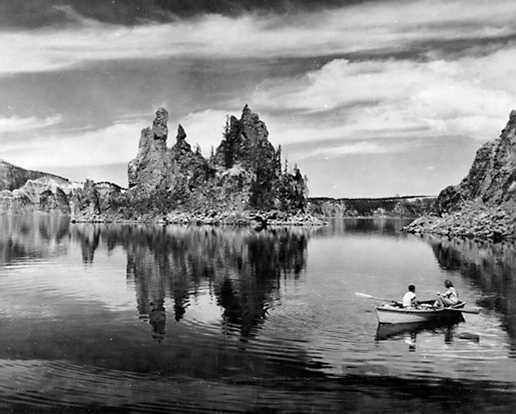 Gilbert, C. & Luxenberg, G. 1990, The Rustic Landscape of Rim Village 1927-1941: Crater Lake National Park, Oregon, US Department of the Interior, National Park Service, Seattle. Griffiths, T. 1991, 'History and natural history: conservation movements in conflict' in The Humanities and the Australian Environment, ed. D.J. Mulvaney Australian Academy of the Humanities, Canberra, pp. 87-109. Hall, C.M. 1992, Wasteland to World Heritage: Preserving Australia's Wilderness, Melbourne University Press, Melbourne. Lang, W. & Mercier, L. 1991, 'Testing for reliability in oral history', Interpreting Local Culture and History, eds J.S. Sanford & J. Austin, University of Idaho Press, Moscow, pp. 103-18. Leffler, P & Brent, J. 1990, Public and Academic History: A Philosophy and Paradigm , Robert F. Krieger Publishing, Malabar, Florida. Linenthal, E. 1994, 'Committing history in public', Journal of American History, Vol. 81, No. 3, pp. 986-91. Mackintosh, B. 1991, National Park Service Administrative History: A Guide, US Department of the Interior, National Park Service, Washington, DC. Mark, S. 1991, 'Planning and development at Rim Village', in Administrative History, Crater Lake National Park, Oregon, US Department of the Interior, National Park Service, Seattle. Rickard, J. & Spearritt, P (eds) 1991, Packaging the Past? Public Histories, Melbourne University Press, Melbourne. Rogers, G.F., Malde, H.E. & Turner, R.M. 1984, Bibliography of Repeat Photography for Evaluating Landscape Change, University of Utah Press, Salt Lake City. Runte, A. 1990, Yosemite: The Embattled Wilderness, University of Nebraska Press, Lincoln. Twight, B. 1983, Organizational Values and Political Power: The Forest Service Versus the Olympic National Park, Pennsylvania State University Press, University Park. Worster, D. 1977, Nature's Economy: A History of Ecological Ideas, Cambridge University Press, Cambridge.